The first major trend I have identified whilst researching cryptocurrency, is that cryptocurrencies are providing new ways for wealth accumulation. Pre-mining is essentially taking units of a soon to be released cryptocurrency by mining them before the cryptocurrency is launched publicly. If the cryptocurrency is successful, the owner(s) who created the cryptocurrency can accumulate wealth at a staggering rate. Just by mining the first block, the ‘Genesis Block’ Satoshi Nakamoto would have earned 50 BTC, which is now equivalent to £335,472.30. In fact, because Bitcoin was hardly used outside of the computer science community in the early years it is advocated that the creator could have mined the equivalent of 1 million BTC which would currently equate to £6,709,445,980.45. Okay but that’s Bitcoin, what other cryptocurrencies have the capability to do that? Let’s look at Ethereum: Ethereum creators pre-mined 60 million units of their cryptocurrency for the Initial Coin Offering and kept 12million for themselves. Within a year of Ethereum being released, with Ethereum trading at $11.80 on July 1st 2016, the creators held $141,600,000 worth of Ethereum. Although this wealth accumulation is based on virtual currency it does beg the question of what government involvement there should be. Because virtual wealth can and is converted back to fiat currency. If a cryptocurrency is garnering a lot of attention, you can bet that the owners will become instantly rich when it is released by investors. Considering the explosion of cryptocurrencies, and the constant changing picture of the big players it would be certainly worth paying attention to the pre-mined rate of new cryptocurrencies. An Initial Coin Offering is very similar to an Initial Public Offering. Initial coin offerings are used to fundraise a cryptocurrency project. The public are promised tokens or units of the cryptocurrency in return for funding the project. There is a funding goal that the Initial Coin Offering has to attain. If it meets this, then the project will go on, if it doesn’t then investors will have their contributions to the project returned. The Ethereum foundation produced a technical framework that could be used to finally manage a larger number of investors and supporters in a transparent automated and simple way. To date approximately $168,000,000 has been contributed through Initial Coin Offerings (ICO) to new cryptocurrency creators. Considering that from 2013 to 2017 the majority of ICOs have completely failed with participants losing of their money. Please see the mangrove report to get a better understanding. Bitcoin.com using tokendata.io’s data has indicated that of the 902 crowd sales that took place last year 142 failed at the funding stage and 276 have since failed, either due to taking the money and vanishing or slowly fading away. An additional 113 ICOs can be classed as semi failed as their team has stopped communicating through social media. 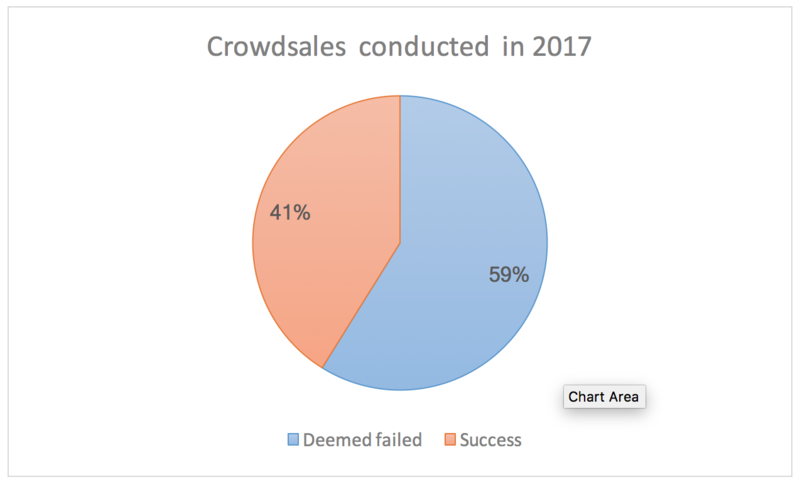 In total this means that 59% of last year’s crowd sales were confirmed as failures. These projects still raised $233 million between them. There does seem to be an over eagerness to be part of the emerging cryptocurrency scene. The United States Commodity Futures Trading Commission has recently warned of the current craze advising against buying into ICO tokens from social media tips. It does not seem to be hard to generate a lot of money from the hype. A proposed ICO simply needs a website filled with cryptocurrency related jargon, a proposed roadmap and development team. In fact, ICOs are making money without the aforementioned even being true. Take this ludicrous example. ‘Miroskii’ an ICO for a cryptocurrency aim to ease the difficulty associated with financial transactions. In Early March the development team listed contained pictures of Ryan Gosling as a lead developer. It has since claimed that it was hacked by Russians. Even if this claim is true it is staggering that whilst the company had Ryan Gosling listed as a lead developer it still generated $830,000 in crowdfunding. Another example was in Mid-February, a New York Based company changed its name from the Long Island Iced Tea Corp to Long Island Blockchain Corp and its publically listed stock jumped 200 percent. Whilst the majority of ICOs are scams it is clear many people are making a lot of money out of ICOs, because it is cryptocurrency regulators need to ask themselves is it worth paying more attention to the creators of ICOs. I have found a few examples here and here that show that theoretically making money through proof-of-stake mining is becoming a trend for alternative cryptocurrencies too. Too make it more likely that you will earn rewards buying masternodes is also an emerging trend. I have found the following websites that will allow users to buy masternodes: https://masternodes.online/ and https://masternodes.pro/. Another emerging trend are ‘airdrops’. Airdrops are when a blockchain project distributes free tokens or coins to cryptocurrency users. Often to be a recipient of an airdrop users often only need coins of a specific cryptocurrency stored in your wallet. For instance, users of Byteball, Stellar Lumens and OmiseGo have all had cryptocurrency dropped into their wallet free. Other airdrops may require a user to make social media posts or to talk to a member of a team on bitcointalk.com. ‘The format of these crypto giveaways is usually like this: At a pre-announced time the project behind the event will take a ”snapshot” of the blockchain, and anyone holding Ether or Bitcoin at that point will receive a certain number of free tokens. This can also be done on other blockchains, but Ethereum and Bitcoin are the most used for this airdrop format.